Indeed, we are really in the season of MTN Awoof. Some few month ago, MTN introduced 30 Minutes Free Calls to Any MTN Number. Again, last Month MTN introduced N33,000 Airtime for N30 for 7days, and i was like "Is this truly from MTN Or What.." Before i knew, MTN Smash his customers with another whooping and surprised Offer, to make Free Call for days With just N40 (Which Is Currently Blazing Now) or N200 for 7days free calls. After i activated this new Blazing trick on my MTN SIM and it works perfectly also, that's When I realize that is not an Error In their System. Today, I want to unveil it to you, join me to enjoy while it last. If your SIM qualified for the offer, simply press " 1 " on your phone keyboard to confirm/activate it. 2. N40 will be deducted from your account and you will be given free MTN calls for 24hrs. Although it last up to 2 to 3 days sometimes, depending on your SIM. If your SIM qualified for the offer, simply press "1" on your phone keyboard to confirm/activate it. 2. N150 will be deducted from your account and you will be given free MTN calls for 7days. 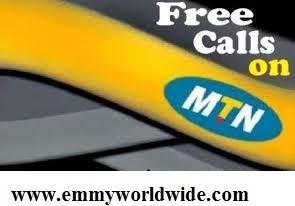 Just call as you like..
You can always check your free mtn to mtn credit/airtime with *559*4#. ==> As at the time of publishing this post, MTN TO MTN FREE CALLS works perfectly on MTN iPulse and MTN True Talk. ==> You can only call MTN Line/SIM. ==> You can only subscribe for new one when the one you are using is expired. ==> It is not Auto renewal, you need to activate it by yourself, each time you want to make free calls as you like.